Update 3.20pm: Emergency services are on scene, and the plane is now approaching the airport. We will update as able. Update 3.22pm: The plane has just landed, and all appears to have gone well from our view. Fire trucks are now approaching the plane. Update 3.35pm: A police spokesperson said, “The Causeway is once again operational and the Jetblue Airline has landed without incident. 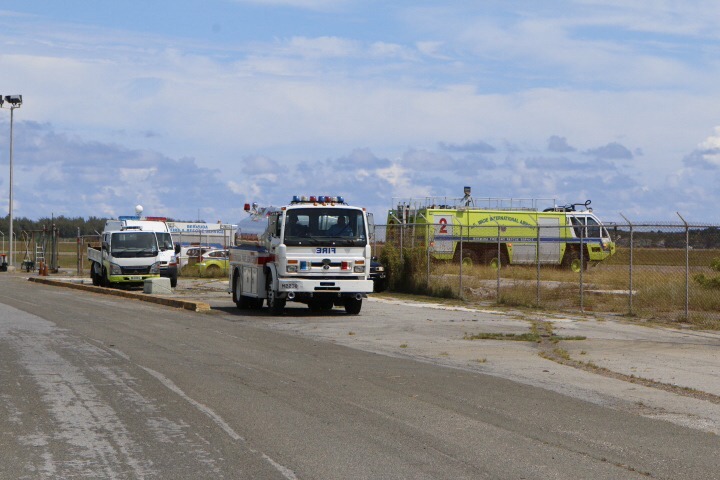 Update 11.03pm: Fire Service spokesperson Leonard Davis reported that, “At approximately 2:47 pm on Friday July 11, 2014, the Bermuda Fire and Rescue Service Airport Operations Division responded to a report of an A321 aircraft declaring an emergency. 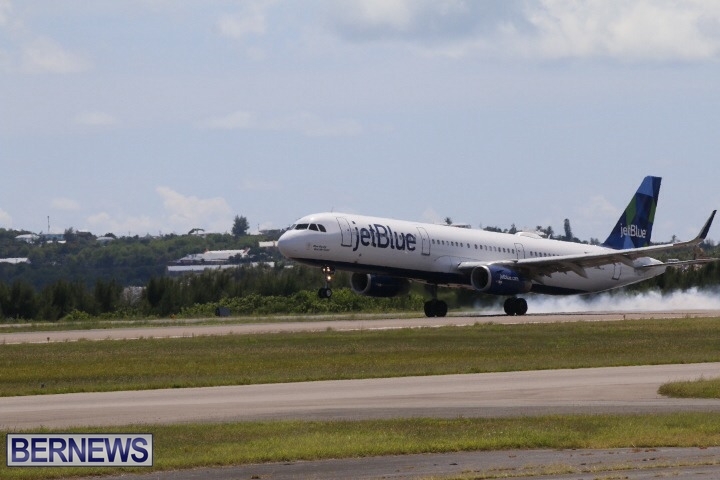 “The Airport Operations Division responded to Jet Blue flight 409 which declared an emergency due to an activation of a smoke indication light in the cockpit. The flight was on its way from JFK New York to Punta Caucedo, Dominican Republic with 173 passengers and six crew members. “The Airport Operations Division responded with six vehicles to their standby positions off the runway as the aircraft prepared to land. At 3:21pm the aircraft landed safely and taxied to an adjacent Apron where an external inspection of the aircraft was conduct by Fire Service personnel. No sign of smoke or fire were seen. “The aircraft then proceeded to the main Apron at the L.F. Wade International Airport followed closely by several Fire Service appliances. Once on scene a more in-depth inspection of the aircraft was carried out using a thermal imaging camera. The cargo holds and avionics bay where checked identifying no signs of smoke or fire. 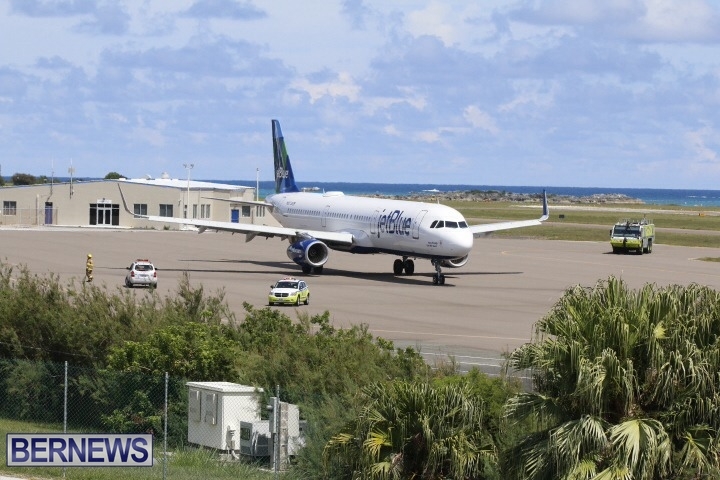 Update 11.32pm: The aircraft that diverted and arrived in Bermuda this afternoon departed LF Wade International Airport at approximately 11.20pm tonight. Stranded passengers are still at the airport awaiting departure on a replacement aircraft which arrived on island at approximately 10pm. Update 11.59pm: Jet Blue flight 409 departed Bermuda a short time ago with passengers continuing on their journey to Punta Caucedo, Dominican Republic after being stuck in Bermuda for approximately eight and a half hours. what is your logic behind that? Scenario: act crashes with several casualties. Traffic is blocked from Blue Hole Hill to Dub City. How will emergency vehicles from Hamilton access L f wade? With the bridge closed, one lane would be completely empty. I assume that is the idea anyway. I do agree it can create more of a problem than it aims to solve. Use the police to keep traffic moving so as to enable emergency vehicles from Hamilton to get to the airport as quickly as possible. thankfully the emergency service personnel don’t take instructions from you. wondering why – if they’re closing the causeway for emergency landings – do they evacuate Ferry Reach or Clearwater Beach/St Davids as well (depending on the direction the planne is approaching from). why is one side of the airfield more “at risk” than the other? Key word here is “Causeway”. The causeway runs from Blue Hole Hill to the footpath bridge at the airport. Planes don’t land over nor take off across this stretch. Kindley Field Road is the correct. Will be sitting next to you. Is there any news regarding the plane? Did it leave Bermuda already? A relative of mine was on the plane and there is no information available. I’ll appreciate any information aboout it. Thanks. I believe there is a replacement airplane at the airport tonight. I heard that there was a mishap once the plane landed. there was a time when ALL traffic had to stop when a plane was incoming over Kindley Field Road,but you young folk wont know about that. Don’t know much about trains either but,hey we progress. Get back on your horse and carriage. I remember that….as a kid, when those roads closed for a landing or takeoff it was a great time for a bit of plane-spotting and a lifelong love of aviation…especially when the USAF was still there…interesting movements in those days!!! There are two reasons why they close the causeway in a situation like this. 1. To limit the number of possible casualties if there is an accident in the area. 2. And two, the biggest reason why, is so that it is clear for emergency vehicles to get through if they need to! With it closed there are no civilians driving on it, so it is clear for emergency vehicles to go at all haste down there. If you really thought it would be closed to emergency vehicles, you must be daft. What about people turning around? What about when traffic is backed up all the way up North Shore, Wilkinson Avenue/Harrington Sound Road? There’s still going to be people driving westward on those roads. micro (brain) picked the correct name! One thing about common sense”………. How will they get through the traffic ? Helos? Having attended dozens of aircraft emergencies in the past, I can say that closing the causeway for emergency aircraft landings was not a normal thing that was done in the past. As it now appears to be some sort of a new procedure, it would be nice for a public press release to be issued by those in authority so that the negative comments, unknown reasons and the mystery of guessing why it is done would be removed for the general public. Giving accurate knowledge/facts is very easy to do and is the key to eliminating controversy and keep some sort of harmony among the island residents. Could you imagine closing 275 for an emergency at ATL? Heaters as in: Brrrrrrrrr I’m cold ? Or am I just not hip enough to understand this term ? I’m glad the airplane is safe.